Hanoi (VNA) - Chairwoman of the National Assembly of Vietnam Nguyen Thi Kim Ngan stated that Vietnam’s Party and State leaders have always supported and provided all favourable conditions for the people’s organizations of Vietnam to unceasingly strengthen the friendship and cooperation with their Lao counterparts. She made the statement at a reception for Somphan Phengkhammy, a Party Central Committee member, Vice National Assembly Chairman, and President of the Committee for Peace and Solidarity of Laos in Hanoi on August 22. Ngan spoke highly of friendship and cooperative activities of the people’s organizations of the two countries, including the Peace Committee of Vietnam and the Committee for Peace and Solidarity of Laos, saying these activities have contributed pragmatically to cementing the time-honoured bilateral ties. 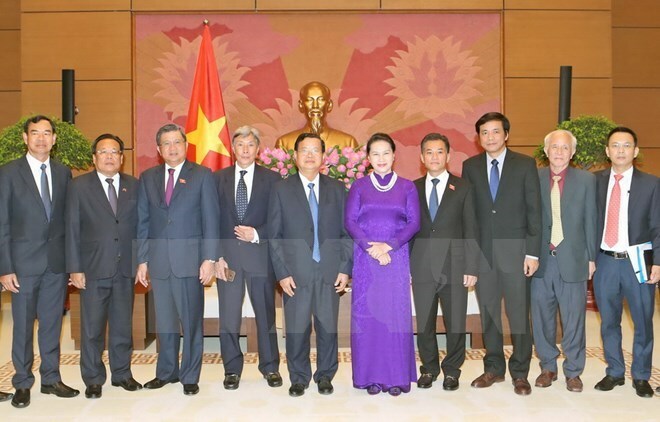 She wished the friendship and cooperation between the two people in general and the two peace committees would reap bigger achievements and help with consolidating the special solidarity and comprehensive cooperation between Vietnam and Laos. Somphanh Phengkhammy briefed Chairwoman Ngan of the outcomes of his talks with Uong Chu Luu, NA Vice Chairman and President of the Peace Committee, saying the two sides agreed to continue bolstering cooperation in practical activities, and working together and supporting each other in people-to-people diplomacy and in communication campaigns to popularize the two countries’ special solidarity and friendship.